string(1130) "Resource Centre > Uncategorized > Counter-Trafficking in Persons Standard Operating Procedure"
USAID takes the issue of human trafficking in government contracts and assistance awards (grants and cooperative agreements) very seriously. 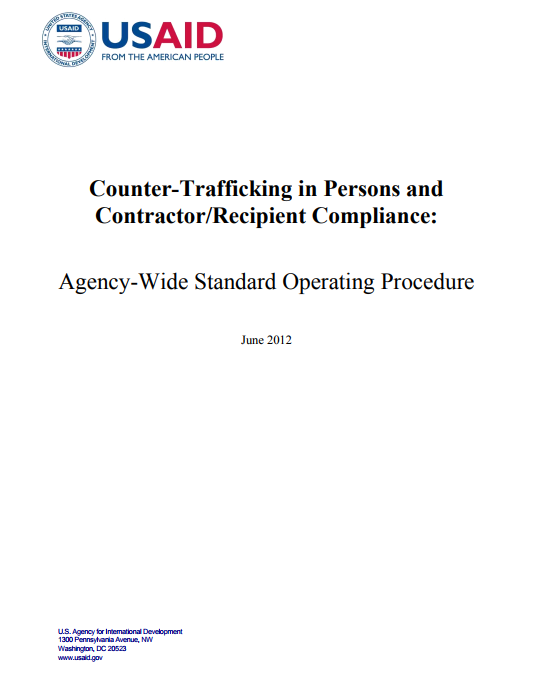 This document demonstrates the current comprehensive standard operating procedure (SOP) of the agency with regards to potential TIP abuses by contractors, sub-contractors, assistance recipients and sub-recipients. While this SOP is in full effect at this time, USAID is aware that this issue has been, and continues to be, evolving over time. Therefore, the SOP will be amended to reflect any necessary changes. The Agency is working directly with the White House and other federal agencies to ensure that not only USAID, but the entire USG, is sharing best practices and developing standards that will be used throughout the federal government to guarantee that TIP abuses in government contracts and assistance awards is no longer an issue.